This entry was posted in Family, Healthy Eating, Recipe Sharing and tagged Clean Eating, Food, Recipe by txa1265. Bookmark the permalink. This looks so good. I was just saying to Rock that we need to get some new squash recipes. I feel like we don’t utilize this veggie enough. Thanks so much for sharing. Hope you enjoy it! I have loved exploring squash and my kids actually like them MORE now rather than less, especially spaghetti squash! Total win! This looks great. 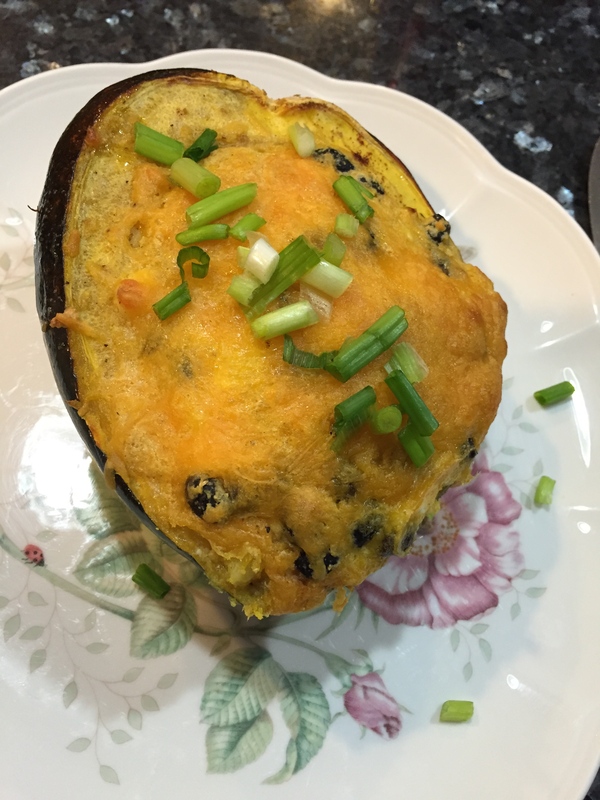 I’ve never done stuffed squash but I love squash in general, so I’ll have to give this a try. Thanks for the recipe! Acorn squash was something we brought for Thanksgiving this year, and one of the usual dishes we had in my family growing up. Roasted and filled with steamed peas. Peas have always been one of my favorite foods so in my effort to get all the peas as a kid, I learned to love the squash too! Yum … peas! I love them and they are Lisa’s fave – will have to try that as a modification next time! Funny I just bought acorn squash tonight for the first time in awhile. I’m planning on just roasting it with some butter, cinnamon and brown sugar, but I’ll definitely try your recipe next! I don’t really use acorn squash just because I have no idea how to cook it (other than in Michele’s pancake recipe!) I think I need to branch out and try other kinds of squash besides spaghetti and butternut. Unfortunately our grocery store usually has a limited variety, so it just depend what looks good each week. But I will have to keep this in mind if I ever decide to try acorn squash! I got these at the local market that has the ‘good’ meat (grass-fed, local, humane) … but I saw them everywhere, from Wegmans to Tops (chain in NY, PA & VT) to Walmart and Target! If they have spaghetti and butternut squash, chances are they have acorn. Take a look. I LOVE squash, especially stuffed squash. Fortunately my CSA box has included plenty of it lately. I’m also a big fan of spicy southwest-y flavors, so I’ll definitely be making this one sometime soon.